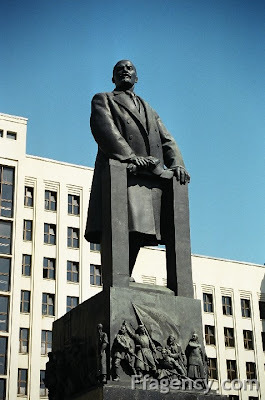 In the Soviet Union, many cities had monuments of Vladimir Lenin, the founder of the Soviet state. 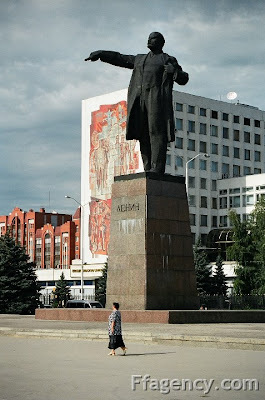 With the dissolution of the Soviet Union in 1991, many statues of Lenin were broken with no permission from their authors. This happened even earlier in the European post-Communist states and in the Baltic states. However, in many of the former Soviet Republics (namely Russia, Belarus and Ukraine) many remain, and some new ones have been erected. In Ukraine Lenin monuments and other Soviet-era monuments are still being removed. 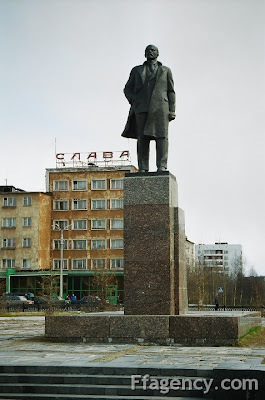 But on the occasion of the 139th anniversary of Lenin two new Lenin monuments where erected in Luhansk Oblast. Lots and lots of builings in the former Soviet are regular and symmetrical in the Stalinist Empire style which dwarfs its human occupants. The "simple" citizen should get the feeling to be just a small brick in the utopian society. DN: Inga nya kläder för Lenin.